Lock-N-Seal™ Coliform Water Sampling Vials (Manufacturer by Excel Scientific). Catalog No. 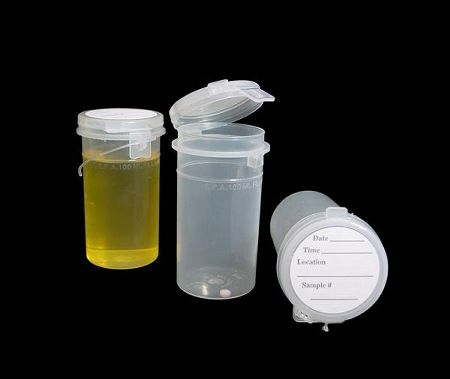 : 22-4954-21 Download "How To Use Lock-N-Seal™ Water Sampling Vials.pdf"
These snap-cap vials are air-tight & leak-proof, Excel Lock-N-Seal™ vials are ideal for all types of sampling and storage needs in the food, dairy, cosmetics, petroleum, and environmental industries. These 120mL sterile, hinged-cap vials meet all EPA requirements for microbiology sampling. Collection, incubation and accurate reading can all be done in the collection vessel without a transfer strap. They are made of durable, contact-clarity polypropylene and will not break or shatter like polystyrene containers. Increased clarity facilitates in-vial colorimetric and UV methods. Lock-N-Seal™ security latch prevents opening during transit. Arrow locking device ensures sterility before use. The 100mL raised fill line makes sample collection easy. Available with or without a sodium thiosulfate tablet to neutralize the effects of chlorine in drinking water samples. Also they are available with or without a chain of custody tie. Also they are available with or without a pre-applied label. A certificate of sterility is available upon request. Compatible with Idexx's Colilert® method of testing; both colorimetric and UV. Manufacturer by Excel Scientific.